You don’t always need a one-to-one trainer-trainee ratio for personal training. A recent trend has been toward using personal training’s tailored techniques and direct coaching methods with small groups, retaining the personal touch so critical to individualized training while also embracing some of the best elements of larger class training. In a group personal training session, you’ll find the physical workout to be similar to what you’re used to from individual sessions. However, the trainer uses more variety to account for the different goals of his clients, giving you a wider exposure to techniques you may be interested in adopting. Groups are typically set up as circuit training, but it’s not uncommon for clients to do the same things at the same time as with an exercise class. Trainers have found that group training ensures you get the great results and individualized accountability of traditional personal training at a fraction of the cost. Group training may seem similar sometimes to any exercise class, but there are some important differences. First, the trainer is not just a class leader. He’s there to ensure you obtain the tailored training you need to achieve your personal goals. When you do something wrong, he’ll correct you, and when you need to move to the next level, he’s there to advance you right away. Additionally, you still have that personal accountability, rather than being just another face in the Zumba crowd. Group training, in fact, enhances that personal accountability using positive peer pressure and competition to motivate you beyond coaching. Weight Watchers has known the secret for decades: if you bring together a small group of people with the same goal, they can reinforce and motivate one another, adding power to each individual’s efforts. While Weight Watcher plans and teachings change over time, one thing remains constant: other dieters are always there to cheer you on or provide silent sympathy, depending on how your weigh-in goes. This is an immensely powerful psychological tool for motivation. Small group training classes use the same compelling technique. Those who share your class help motivate you to push harder, and silently demand accountability when you don’t do as well as you should. The crowd cheers you on when you are successful – when you lift more, exceed your weight loss goal, try difficult new maneuvers or equipment. The class becomes a team, with each person’s individual efforts coming together to amplify everyone’s progress. This fresh community positivity by itself makes a well-designed group session better than individualized training for many people. But increasing efficiency in a system always has another effect: it makes it cheaper to do more. When you attend group training sessions, you have access to more frequent training at a lower price, up to six days a week if your trainer agrees it will benefit you. Because frequent personal training helps reinforce habits, group training provides intense focus on setting habits while ensuring you still remain accountable and focused. You don’t have to start with group training, either. If you want more personal instruction when you start training but later decide you don’t need as much attention, you can easily switch over to group training. You get to skip the small talk that’s often a big part of individualized personal training, instead focusing on getting your workout done with professional guidance and then going home. 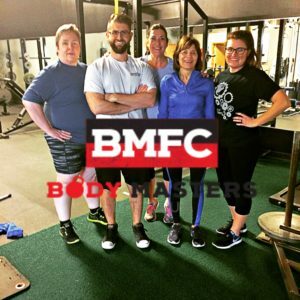 Body Masters would love to help you get started on your personal training in either a private or group setting. If you’re ready to start working toward a healthier, happier you, give us a call today.